Now 80, Woody Allen continues to crank out movies. We find his newest effort via 2015’s Irrational Man. Set at fictional “Braylin College” in New England, philosophy professor Abe Lucas (Joaquin Phoenix) arrives as a new hire and finds himself at self-described emotional rock bottom. His seedy reputation precedes him at Braylin, especially with the female students, who seem eager to meet the notorious – and attractive - professor. Alas, Abe’s mopey state renders him unable to perform in the sack. Still, Abe launches into a relationship with student Jill Pollard (Emma Stone) – even if they can’t consummate matters in a carnal way, they enjoy each others’ company. Eventually Abe experiences a revelation that also wakes him up below the border. Has Woody Allen ever made a movie without self-infatuated intellectuals? Yeah, but that theme pervades much of Allen’s material, and it can cause a drag. At least Irrational Man seems aware of this trend, as occasionally feels like it mocks these sorts of smug folks. Barely, that is. At first, Irrational Man shows hints that it wants to wink at the notion of the depressed, nihilistic professor, but before long, it collapses under the weight of its pretensions. Allen seems to smirk at the participants less and embrace them more. If Abe, Jill or any of the others offered compelling personalities, this would be okay, but they remain one-dimensional. Even after Abe’s “awakening”, he remains a thin character. Neither he nor Jill really develop, as they continue to come across as archetypes and nothing more. The story doesn’t help. Irrational Man offers more of a “plot concept” than a fleshed out narrative, so it never develops into a fluid, coherent tale. It’s just a collection of connected vignettes without a lot of positive movement. Phoenix, Stone and the supporting actors fail to elevate their roles, but I can’t blame them. Allen saddles the performers with such stiff, “scripted” dialogue that the lines stumble out of their mouths. The actors seem unconvinced by their lines, and so will the audience. Honestly, it’s hard to believe an experienced filmmaker like Allen wrote this script. Irrational Man feels more like a first screenplay from a neophyte. It’s not a good look for Allen, and this becomes a disappointing effort. 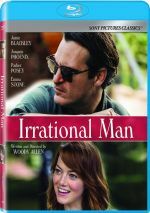 Irrational Man appears in an aspect ratio of approximately 2.40:1 on this Blu-ray Disc. This was a good but not great presentation. Sharpness was usually strong. Most of the film looked pretty concise, but some light softness occasionally crept into a few wide shots. This wasn’t a big deal, though, so the majority of the presentation remained well-defined. No concerns with jagged edges or shimmering occurred, and edge enhancement remained minor. Source flaws also failed to create problems. In terms of colors, Irrational Man went with a palette that favored a strong golden tone. Within those parameters, the colors appeared pretty clear and concise. Blacks were deep and firm, while shadows showed good delineation. All of this left us with a “B” transfer. Not that long ago, Woody Allen continued to stick his movies with monaural soundtracks. While he’s now broadened to the wild world of DTS-HD MA 5.1 audio, one shouldn’t expect much from the soundscape, as it remained decidedly low-key. Though the mix expanded past Allen’s old mono days, it still seemed modest in scope. Music showed good stereo imaging, and effects used the side and rear speakers in a gentle manner. Not much occurred in this regard, though, so the mix seemed rather restricted. Audio quality was fine. Speech sounded natural and distinctive, without edginess or other issues. Music sounded peppy and warm. Effects had little to do but were clean and accurate. This was an acceptable track. Woody Allen releases skimp on extras, and Irrational Man seems skimpier than most. It comes with the film’s trailer and that’s it. While Woody Allen still produces the occasional winner, a lot of his 21st century movies flop, and Irrational Man becomes one of his less successful efforts. It doesn’t sink to the depths of his worst work, but it comes with too many flaws to be worthwhile. The Blu-ray presents solid visuals and decent audio but lacks supplements. Leave this one for diehard Allen fans.